Bacillus cereus constitutes a significant cause of acute food poisoning in humans. Despite the recent development of different detection methods, new effective control measures and better diagnostic tools are required for quick and reliable detection of pathogenic micro-organisms. Thus, the objective of this study was to determine a simple method for rapid identification of enterotoxic Bacillus strains. Here, a special attention is given to an electrochemical biosensor since it meets the requirements of minimal size, lower costs and decreased power consumption. 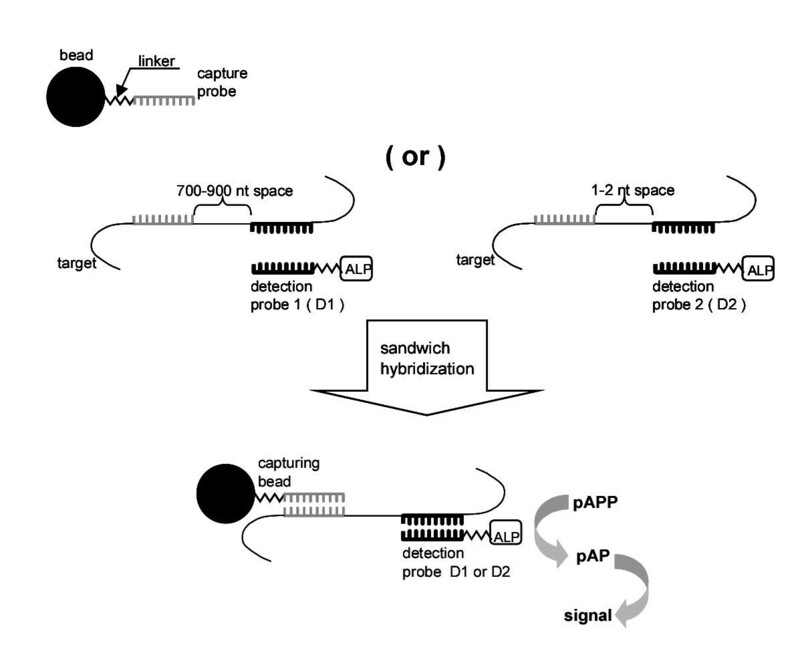 A bead-based sandwich hybridization system was employed in conjugation with electric chips for detection of vegetative cells and spores of Bacillus strains based on their toxin-encoding genes. The system consists of a silicon chip based potentiometric cell, and utilizes paramagnetic beads as solid carriers of the DNA probes. The specific signals from 20 amol of bacterial cell or spore DNA were achieved in less than 4 h. The method was also successful when applied directly to unpurified spore and cell extract samples. The assay for the haemolytic enterotoxin genes resulted in reproducible signals from B. cereus and B. thuringiensis while haemolysin-negative B. subtilis strain did not yield any signal. The sensitivity, convenience and specificity of the system have shown its potential. In this respect an electrochemical detection on a chip enabling a fast characterization and monitoring of pathogens in food is of interest. This system can offer a contribution in the rapid identification of bacteria based on the presence of specific genes without preceding nucleic acid amplification. Bacillus cereus is one of the more important pathogens responsible for food poisoning throughout the world [1, 2]. It is a Gram-positive aerobic or facultative anaerobic, spore-forming, rod-shaped bacterium commonly found in soil, dust and air [3, 4]. B. cereus causes two different types of food poisonings, namely the emetic type and the diarrhoeal type [5–7]. Both types of illness are relatively mild, without specific complications and usually last for less than 24 h. However, there have been occasional cases of B. cereus poisoning which lead to death by liver failure due to an increased amount of produced bacterial toxins . Moreover, other clinical manifestations of B. cereus infection or contamination have been observed . Large differences in the amounts of enterotoxins produced by different strains makes it difficult to give a total infective dose of B. cereus for human illness. Generally, consumption of foods that contain more than 106 B. cereus per gram may result in food poisoning [9, 10]. B. cereus is classed within the B. cereus group which comprises also B. anthracis, B. thuringiensis and B. mycoides. Recently, a B. pseudomycoides and a B. weihenstephanensis were also grouped here . This classification is based on phenotypic reactions [11–13]. B. cereus is often associated with heamolysin production. However, only about 50% of the B. cereus isolates were found to produce the haemolysin . On the other hand, it was recently shown that the genes from the haemolysin operon (hbl) are widely distributed among the B. cereus group . The presence of B. cereus in food products cannot be avoided but should be minimal and must be effectively controlled. For this purpose, a variety of methods have been recommended for the confirmation and enumeration of these bacteria in foods. Conventional assays that are most commonly in use are based on the biochemical characterization of B. cereus by means of selective plating combined with immunological methods. However, these methods require at least one day for performance and thus are time consuming, especially when products with short shelf-lives like milk products have to be assessed. New effective control measures and good diagnostic tools are required which ensure the quality of food products and eliminate threat of food poisonings caused by B. cereus. This is a major public health concern and new methods are needed. In recent time, DNA analytics using electrochemical detection on a chip has become an increasingly implemented method in biotechnology. Electrochemistry has superior properties over the other existing measurement systems. It appears to be a useful alternative to the conventional one mainly due to lower cost in comparison with expensive optical devices and easier way to handle electrical components useable for in field measurement. Although relatively simple in concept, electrochemical detection on a chip is powerful tool for food analysis, i.e. for pathogen detection and characterization. This work describes the development of the electric chip technique for the specific detection of haemolysin producing B. cereus by taking advantage of the nucleotide sequences of two B. cereus toxin-encoding genes. Two genes from the Hbl operon that encode haemolysin BL were used as chromosomal markers for rapid detection of B. cereus [11, 14, 15]. The DNA sequence detection basically consists of four steps: target and detection probe hybridization, enzyme label binding, enzymatic reaction and amperometric detection of the enzyme product. A protocol for the direct detection of B. cereus without extracting DNA is presented. The amplification of the targeted fragments from samples of DNA isolated from three bacteria strains, B. cereus, B. subtilis, and B. thuringiensis, was performed. The annealing temperatures were optimized individually for each primer pair of the hblC and hblA genes. The amplicon of the hblC and hblA genes had a predicted size of 874 bp and 747 bp, respectively. Fragments of the expected size were successfully amplified from DNAs of B. cereus and B. thuringiensis. No products were generated in PCR assay with B. subtilis DNA (data not shown). The identity of the obtained PCR products was further verified by restriction analysis. Endonucleases were chosen to cut each PCR product into two fragments of defined size. The hblC amplicon was digested with Dra I to fragments of 458 and 289-bp size. The hblA product was digested with Sac I, cleaving the amplicon in parts of 520 and 354-bp size. In each case, the expected fragments were observed (data not shown). Next, the PCR amplification products of the hblC and hblA genes were utilized as artificial targets in subsequent biochip experiments. Electrochemical measurements for detection of DNA of selected genes were performed with the electric silicon chip according to the protocol described in Methods. DNA target was hybridized to the magnetic beads with immobilized amino-linked capture probes as well as with gene specific detection probes labeled with biotin (Table 1, Figure 1). Sequences of PCR primers and DNA probes used in this work. *X and Y stand for amino-group and biotin, respectively. Outline of the bead-based sandwich hybridization on the electric chip. The two alternative positions of the detection probes are indicated. Prior to the biochip analysis, the immobilization of capture probes to the magnetic beads has to be done (in Methods). Covalent attachment of amino-linked capture probes to carboxylic beads was chosen to achieve defined orientation and high linkage stability. For the general establishment of the bead-based sandwich hybridization assay, a bead concentration of 1 × 105 per microliter (that is 2 × 107 capturing beads per assay) was chosen as a constant experimental parameter. The choice was made on the basis of theoretical calculations for a large capture probe excess in assay. The signal obtained from the bead-based sandwich hybridization reaction is influenced by a variety of parameters. Basically it should depend on the concentration of target analyte as well as the detection probe in the assay. To study the relevant concentration ranges of these factors, the signal was documented under conditions where one of these parameters was varied whereas the second was constant. The assay conditions here included 1 h hybridization at 40°C, 1 h enzyme binding and 2 h enzymatic reaction at 30°C. 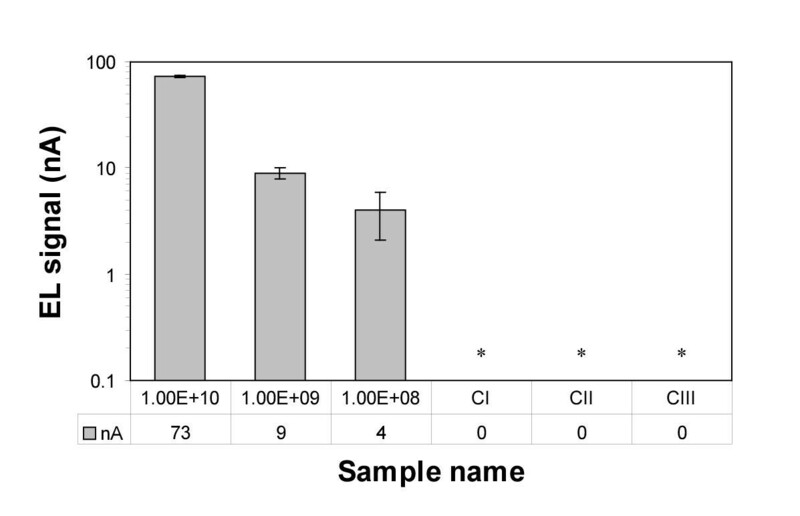 The assay was first tested to detect 0.1 nM of the 747-bp hblC PCR product with varying amount (0.001 nM – 100 nM) of detection probe (HblC D1) in the reaction (data not shown). Using this configuration (probe HblC C and HblC D1) all amplicons created during PCR assay will be detected, and no conclusion can be driven from a positive signal concerning the specificity of the PCR product. In this experiment the minimum detection probe concentration for maximum signal could be determined. The negative control containing no detection probe and no target DNA gave a signal close to zero, indicating that the enzyme conjugate was binding specifically. The detection level for 0.1 nM target analyte was reached at 0.01 nM detection probe. Increment of the detection probe concentration to 0.1 and 1 nM resulted in proportionally increasing signals, but further detection probe concentration did not increase the signal. Signal saturation was reached employing a tenfold excess of detection probe over target analyte. Thus, the detection probe concentration of 10 nM was chosen for further experiments. In the next step, the minimum amount of DNA target (hblC PCR product) that is detectable in the assay was determined (data not shown). It became obvious that the protocol at this phase of its optimization works even for detection of 0.001 nM DNA target, that is 200 amol (108 molecules) in 200 μl of assay volume. Signal saturation was reached with 1 and 10 nM target. Experiments with in vitro synthesized target DNA (PCR product of the hblC toxin gene) led to the development of a general procedure for the electrochemical detection on chip. The obtained results underlined the importance of target to probe ratio for reliable electric response. Summing up, to provide a measure of target in a sample, capture and detection probes should be in excess. The experimental results and numeric evaluation of the most sensitive assay indicated that reliable target interrogation is allowed employing capture probe to target to detection probe ratio of 500:1:10. The results from the previous experiments were applied to set up a procedure for analysis of the hblC gene in assays containing genomic B. cereus DNA. To establish that the assay was able to detect DNA from biological samples, B. cereus cells were disrupted mechanically by two-cycle French Press disintegration and the crude lysate from 1010, 109 and 108 cells was applied directly to the assay after heat treatment and centrifugation (Figure 2). For this experiment a new detection probe (HblC D2) was employed in the assay (Figure 1). This probe hybridizes in the target sequence adjacent to the capture probe. The reason for the use of new detection probe was the consideration that due to mechanical degradation of the DNA in cell homogenization the target sequences might be too short for successful detection with HblC D1. The assay was compared with three different controls and it was found that the components of the lysate did not generate any background signal. When using crude cell lysates, the sensitivity of this assay was comparable to results from artificial DNA assays (i.e. assays with PCR product). 108 target cells, approximately 200 amol, resulted in a significant signal. Accessibility of B. cereus cell lysate obtained by two-cycle French Press disintegration for the electric chip assay of the hblC gene. The lysate was heat treated (95°C/10 min) and solid particles were removed by centrifugation (5000 g/10 min). The hblC DNA targets were detected in an equivalent of 1010, 109, and 108 bacterial cells, using 2 × 107 capturing beads and 10 nM HblC D2 probe (1 h hybridization at 40°C, 1 h enzyme binding, and 2 h enzymatic reaction at 30°C). Control I: capturing beads and target without detection probe; Control II: capturing beads and detection probe without target; Control III: capturing beads without target and detection probe. Parallel, the investigations aimed to provide direct comparison of the electrochemical responses derived from assays with different target analytes were done. Three different analytes, i.e. the PCR product, purified DNA, and crude cell lysate (1.4 × 109 molecules each), and HblC D2 were utilized in the hblC assay (data not shown). A large difference in measured current between these three assays was obtained emphasizing an influence of the hybridization efficiency on the assay sensitivity. This may be due to variations of molecular size of the target fragments. The largest DNA molecules were present in the sample of purified DNA, which generating the lowest signal. The PCR product had a unique size (747 bp) and the detected signal was higher than in the case of pure DNA analysis. Finally, DNA from whole-cell lysate, gave the highest assay signal. This was probably caused by a high population of short target sequences due to the mechanical homogenization of the sample, with advanced mobility and hybridization properties. Comparative experiments with PCR products, purified genomic DNA and crude cell extract DNA showed that the sequence complexity of target molecules had a great effect on the biochip response. The hybridization efficiency can vary with the length of target molecules in the assays. The large DNA molecules (purified genomic DNA) have a low degree of mobility, which reduces the contacts between the target molecules and the capture probes. Furthermore, captured long target molecules may cover other capture probes on the bead surface and reduce the availability of free hybridization sites. Moreover, in long DNA fragments secondary structures as a result of intra-molecular Watson-Crick base pairing may hide parts of the target sequence. Yet a possible source of the low signal from the purified genomic DNA was observed in the spectrophotometrical analysis and electrophoresis which showed that part of the isolated DNA was lost during the preparation. Such purifications are never 100% efficient and this limits quantitative work. Therefore, the distribution of DNA fragment types in a given sample may by unequal and not representative for the bacterial genome. To study the influence of the distance between the capture and detection probe in the target sequence on the electric signal, two alternative detection probe placements in the target sequence were investigated. Two different detection probes were available and ready to use in bead-based hybridization assay. Detection probe number 1, i.e. HblC D1, and HblA D1, complementary in sequence to the lower PCR primer, thus hybridizing distinct from the capturing probe at the 3' end of PCR product, and detection probe number 2, i.e. HblC D2, and HblA D2, which were designed to hybridize closely to the capturing probe (Figure 1). The experiments were aimed to detect the sequences of two selected genes, hblC and hblA, by employing either PCR amplicons or DNA in cell lysates as analyte material. 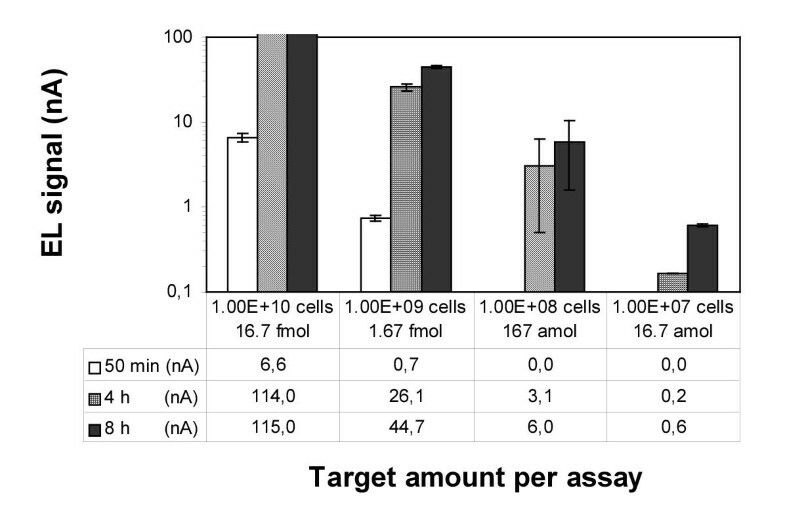 Assay responses are presented as a percentage of the maximum signal that was recorded from the detection of either PCR target or cell lysate (Figure 3). The results showed that there is a strong correlation between the signal and the relative position of the two hybridizing sequences that probably influences the accessibility of the probes to the complementary region. It was concluded, that the primary influence of the target length on the assay is based on the exposition of the detection probe hybridization site in the target molecule. The terminal sequence gives better exposition and more efficient hybridization. At the same time, the effectiveness of the association reaction was reduced when the hybridization sequences were located within the target molecule. In this way, the hybridization efficiency in the assay with PCR amplicons utilizing probes D1, was approximately 95% higher when compared to the use of detection probes D2. Thus, assays targeting PCR products should employ probes which mimic the PCR primers. 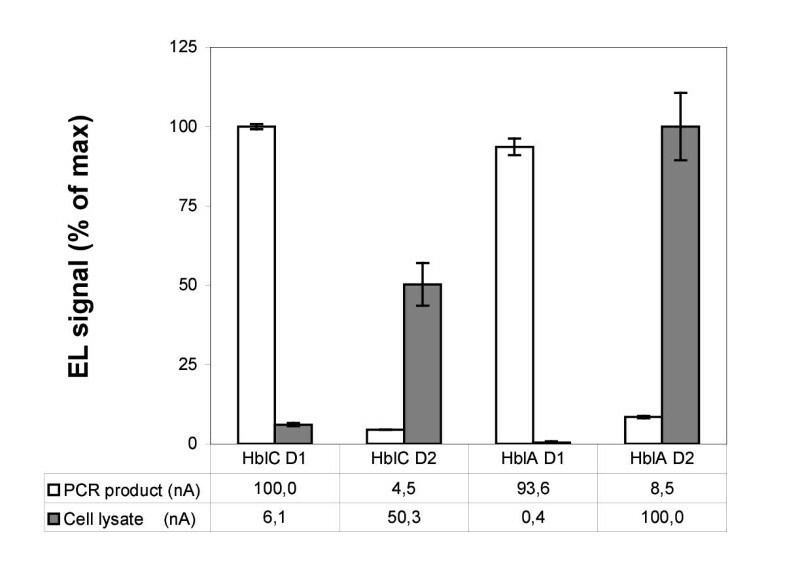 Effect of target length and probes positions on the assay of hblC and hblA. Assays were performed using 0.4 nM PCR product (transparent bar) or 1.4 × 109 lysed cells (solid bar) as targets, 2 × 107 capturing beads, and 10 nM of each detection probe (1 h hybridization at 40°C, 1 h enzyme binding, and 30 min enzymatic reaction at 40°C). 100% signal corresponds to 109.9 nA in case of PCR product, and 7.4 nA in case of DNA in crude cell lysate. 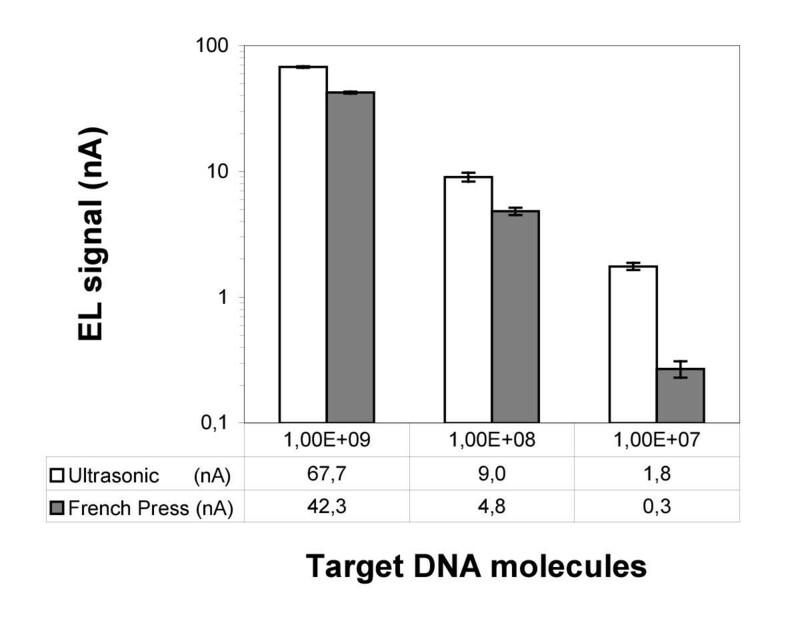 Further, the combination of two different detection probes in assays of DNA in crude cell lysate (Figure 3) showed that in contrast to PCR targets, the D1 probes were unsuitable for the analysis of cell lysates. The reason here might be the small fragments of the DNA target strand. Successful analysis with detection probe D2 required an integral sequence of only 50-bp length. The assay was a multiple more sensitive using these probes as simultaneously the fragmentation ensures sufficient exposition of the hybridization sites. The analysis of DNA from cell lysates requires the combination of a capture and a detection probe which hybridize next to each other since the complementary target fragments are very short. Summing up, the distance between capture and detection probe is a crucial factor for an efficient detection process. Small fragments of the analysed target sequence are preferable for sensitive nucleic acid chip performance. The predominant parts of the assay time are the hybridization and the enzymatic reaction. By extending these reaction times, higher sensitivity is achieved. The relationship between sensitivity and assay time for analysis of vegetative B. cereus cells is shown in Figure 4. The detection limit here was 107 target cells (16.7 amol DNA) which required 4 hours. A 50 minutes assay resulted in a significant signal for 109 cells. Assay time in relation to detection sensitivity. 2 × 107 capturing beads and 10 nM HblC D2 probe were used in each assay. 50 min assay (transparent bar): 20 min hybridization at 40°C, 10 min enzyme binding, and 30 min enzymatic reaction at 40°C; 4 h assay (grey bar): 2 h hybridization at 40°C, 10 min enzyme binding, and 2 h enzymatic reaction at 30°C; 8 h assay (black bar): 6 h hybridization at 40°C, 10 min enzyme binding, and 2 h enzymatic reaction at 30°C. The specificity of the assay with the selected capture and detection probes for the hblC and hblA toxin gene detection was tested against single strains of two different Bacillus species. B. thuringensis, positive when tested with PCR, gave a response in the electric chip assay comparable to that from B. cereus. 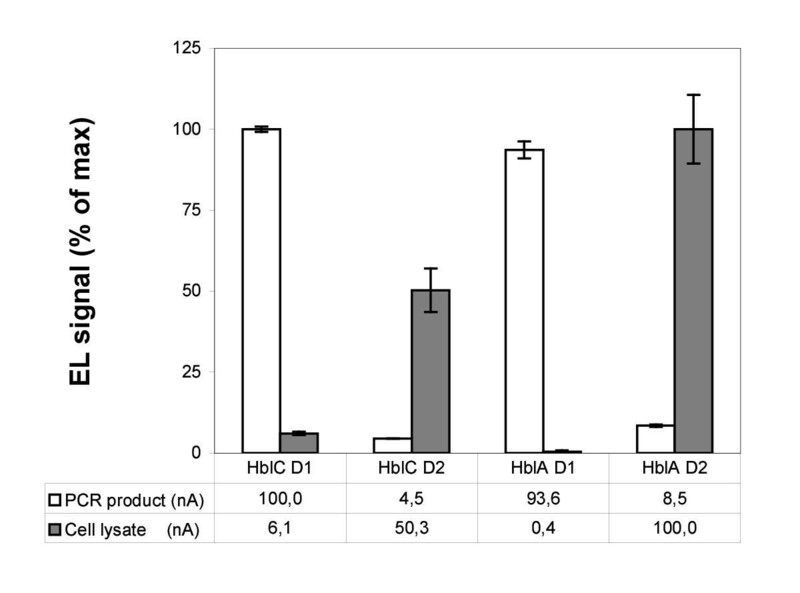 The presence of the hblC and hblA genes in B. subtilis was negative when tested with PCR as well as in the electric chip, thus confirming the selectivity of the probes under the sandwich hybridization conditions. The results are summarized in Table 2. These studies proved that the signals were created only if the targeted genes were present in the sample. Specificity of the electric chip assay of the hblC and hblA genes in Bacillus species. Assay with 2 × 107 capturing beads and 10 nM detection probe D2. Expansion of biochip experiment to control strains, a haemolytic B. thuringiensis and a non-haemolytic B. subtilis, confirmed high specificity of the developed assay. The specificity of the assay is mainly based on the design of the probes in combination with the stringent hybridization and washing conditions. In addition, when short target fragments are chosen for detection, the risk of false BBSH complex formation is minimal. The probability that both probes hybridize unspecifically to the same short sequence of the target is extremely small. A comprehensive tool for sample analysis in the field requires deployment of an integrated cell disruption method. So far the analysis has been done by employing cell lysates from the high pressure homogenization. Afterwards, we realized that an ultrasonic cell disruption has outstanding advantages for this purpose. It is rather fast and can be processed for small sample volumes. Moreover, miniaturised instrumentations are available . The following experiments were directed towards integration of ultrasonic cell disruption into the analytical method. Thus, a two-cycle French Press disintegration was compared with 5 min ultrasonication for analysis of 107 to 109 B. cereus cells (Figure 5). In these assays the ultrasonication resulted in a slightly higher signal. Therefore this method was optimized with respect to time (data not shown). Microscopic analysis revealed that almost all cells were disrupted after 30 s of ultrasonication. Using shorter time, the disruption stays incomplete and causes loss of potential DNA target material which remains in the cells. The electric chip signal continued to increase with further ultrasonication time up to 5 min. This may be due to an increased hybridization efficiency caused by the DNA fragmentation, as discussed above. The electric chip was also used to identify spore DNA of B. cereus. Prior to the assay endospores of microbial pathogens were disrupted by ultrasonication. By using an assay with 2 × 107 capturing beads and 10 nM HblC D2 probe, as few as 107 spores resulted in significant signals (Figure 6). The negative control containing undisrupted spores gave a signal close to zero, indicating that the recorded signals were exclusively based on the detection of released endosporal DNA. For the spore assay, optimal sonication time was about 10 minutes. Comparison of cell disruption methods for lysate analysis with the electric chips. Vegetative B. cereus cells from the same culture were disrupted by 5 min ultrasonic disruption (transparent bar) or high pressure homogenization (solid bar). Each sample was analysed in an assay with 3 × 107 capturing beads and 10 nM hblC D2 probe (2 h hybridization at 40°C, 10 min enzyme binding, and 2 h enzymatic reaction at 30°C). Spore DNA analysis. B. cereus spores were harvested from a 4-day-culture; the spores were washed three times and resuspended (both in PBS buffer, pH 7.4). Disruption was performed with an ultrasonic disruptor, using a microtip and 50 W power output at approx. 20 000 Hz for 5, 10 and 15 min. The assay included an equivalent of 1 × 107 disrupted spores, 3 × 107 capturing beads and 10 nM HblC D2 probe (2 h hybridization at 40°C, 10 min enzyme binding, and 2 h enzymatic reaction at 30°C). In this work, progress of a miniaturized system for rapid detection of enterotoxic B. cereus was described. Different stages of the procedure were analysed and optimized separately before the present level of sensitivity and assay time was obtained. For successful control measurements in timely manner there is a need for a fast and reliable technique for detection of pathogenic micro-organisms. Here, studies on the procedural time showed that the assay might be very short, depending on the detection limit. The performed experiments provided a refinement of the detection on a chip and proved the value of the system for such analyses. A major breakthrough in this method was achieved by eliminating the PCR step from the assay. Special advantages for the assay performance were produced with the deployment of ultrasonic cell disruption. Micro-organisms included in this work were obtained from various culture collections. The B. cereus strain ATCC 14579 was purchased from the American Type Culture Collection, Manassas, USA. B. subtilis W168 was kindly provided by A. Iwanicki, Department of Molecular Biology, Gdansk University, Poland. B. thuringiensis Bt75 was provided by Dr G. Dalhammar . All bacteria were grown aerobically with shaking at 30°C. B. cereus was grown in nutrient broth (Standard 1 Medium, Merck KgaA (Darmstadt, Germany), pH 7.0), supplemented with 1% (w/v) glucose. B. subtilis and B. thuringiensis were grown in Luria-Bertani (LB) broth , pH 7.1, also supplemented with 1% (w/v) glucose. All oligonucleotides (with or without 5' or 3'-amino-group or biotin modification) were ordered from Thermo Hybaid GmbH (Ulm, Germany). The designed primer pairs for PCR and probes for chip analyses are listed in Table 1. The amino-groups or biotin were linked to the probes with a spacer sequence of a few bases in length, each of which was selected non-complementary to the target strand. HblC U, HblC L, HblA U, and HblA L probes were primer pairs (upper and lower primer, respectively) designed from hblC and hblA sequences by computer analysis using the Oligo™ primer analysis software (MedProbe, Oslo, Norway). The sequences of the B. cereus hblC and hblA were obtained from the EMBL database (AJ237785). For each of these genes, two different detection approaches were developed and employed in the assay. The capturing probe (C) that was identical in sequence to the upper PCR primer, and either detection probe 1 (D1) or detection probe 2 (D2) were utilized. Probe D1 was identical to the lower PCR primer. In contrast, the D2 probe hybridized with only 1-bp space (in the case of hblC gene) or 2-bp space (for hblA) directly next to the capturing probe. DNAs of various Bacillus species (B. cereus; B. subtilis; and B. thuringiensis) extracted by means of QIAamp DNA Mini Kit (QIAGEN Inc., GmbH, Germany) according to the manufacturer's protocol were used as templates. PCR assays were performed in a DNA Thermal Cycler (MJ Research). Reaction volumes of 50 μl contained 1 μl of genomic DNA (ca. 5 ng of DNA), 2.5 units of Taq Polymerase (Rosche Diagnostics, Mannheim, Germany), deoxynucleoside triphosphates at a concentration of 200 μM each, and primers at 500 nM each in reaction buffer (10 mM Tris-HCl, 1.5 mM MgCl2, 50 mM KCl, pH 8.3). The amplification of specific fragments was performed by using PCR for one cycle DNA pre-denaturation at 95°C for 4 min, and next 35 cycle repeats, each consisting of 45 s denaturation at 95°C, primer annealing for 1 min at 50°C for HblC U and L couple, and at 60.1°C for HblA U and L pair, and 2 min DNA elongation at 72°C, with a final extension step at 72°C for 10 min. After DNA amplification, PCR fragments were analysed by submarine gel electrophoresis, stained, and visualized under UV radiation. To identify the PCR products, amplicons were verified by endonuclease restriction analysis. The PCR product of the hblA gene was digested with Sac I, and hblC gene with Dra I (both from Fermentas, Vilnius, Lithuania) prior to agarose gel electrophoresis. Bacillus cells were grown in an appropriate medium at 30°C overnight in a shaker at 150 rpm. One milliliter of the culture grown over night was used to start a culture that was grown to mid-log phase (absorbance at 600 nm of 0.6–0.8). Vegetative cells were collected by centrifugation (5000 g, at 4°C for 20 min) and resuspended in PBS buffer pH 7.4 to the desired final cell concentration. Chromosomal DNA was extracted by means of QIAamp DNA Mini Kit (QIAGEN Inc., GmbH, Germany) according to the manufacturer's protocol. The DNA was analysed by agarose gel electrophoresis, and the DNA concentration was measured with a spectrophotometer at 260 nm. B. cereus was also used for analysis of bacterial spores. Cells were cultivated aerobically at 30°C in Standard 1 Medium with 0.4% (w/v) glucose supplementation and 5 mg/l of manganese (II) sulfate with 180 rpm shaking for 96 hours to induce sporulation. The sporulation was checked by observing the cells periodically under a phase contrast microscope at 1000× magnification (Olympus BH2-RFCA). The spores were pelleted by centrifuging at 5000 g for 20 min, and resuspended and washed three times in PBS buffer, pH 7.4. Both, vegetative cells and spores were disrupted to obtain lysates using a high pressure homogenizer (French Pressure cell press, SLM Aminco Instruments). Disruption was performed in two passages at 16 000 psi cell pressure. The disruption efficiency was controlled by microscopy at 1000× magnification. Alternatively, the ultrasonication was applied for cell and spore disintegration. The ultrasonic device was a Branson Ultrasonic Disruptor with a microtip 3 mm in diameter. The average applied ultrasonic frequency was between 19 850–20 050 Hz, corresponding to microtip amplitudes between 59.5 and 302 μm. The power output at the microtip was 50 W. Afterwards, the lysates were heat treated (95°C/10 min) and solid particles were removed by centrifugation (5000 g/10 min), and then applied directly to the assay. To immobilize NH2 single-stranded capture probe onto beads, an equivalent of 2 × 108 beads (100 μl of stock solution) was washed twice with an equal volume of 0.01 M sodium hydroxide for ten minutes and four times with de-ionized water in the same way. The beads were afterwards magnetically separated from the liquid phase. The amino-labeled capture probes were dissolved to a final concentration of 17 μM in 0.4 M MES buffer (2-[N-Morfolino]ethonesulfonic acid) pH 5.0, 70 μl of which (containing 1.2 nmol capture probe) were added per 2 × 108 beads and incubated for 30 min. The immobilization reaction was initialized by addition of 3 mg EDC in fresh solution (100 mg/ml MES buffer) per 2 × 108 beads. The reaction mixture was incubated for least 10 h at 4°C with slow rotation (Eppendorf Thermomixer compact) to allow conjugation. After incubation, active binding sites on the carboxylic beads were blocked by four repeats of washes with 0.1 M ethanolamine, followed by four washes with PBS buffer (Phosphate-buffered saline) pH 7.4 containing 0.5% (w/v) BSA (bovine serum albumin) (Sigma, Steineim, Germany). The beads were resuspended to the desired concentration in the same buffer and stored at 4°C. The efficiency of the immobilization was determined by measuring the optical density of the supernatant at 260 nm. This value correlated to the amount of unbound oligonucleotides left in the solution which was further converted to express the percentage of immobilized probes. The principal steps of the analysis are depicted in Figure 1. It is based on an electric chip combined with a bead-based sandwich hybridization (BBSH). The magnetic particles with carboxyl groups on the surface (Dynabeads M-270 Carboxylic Acid) (Dynal S.A., Oslo, Norway) are utilized for covalent attachment of capture probes via six-carbon atom linker. Target DNA is exposed at the same time to capturing beads, and to biotin labeled detection probes. Extravidin-alkaline phosphatase complex (Ext-ALP) (Sigma, Steinheim, Germany) is then added. For signal generation at the electric chip the enzyme substrate, p-aminophenyl phosphate (pAPP) (ICN Biomedicals Inc., Aurora, OH, USA) that forms product, p-aminophenol (pAP) upon reaction with ALP is used. PAP is redox-cycled at the chip electrodes thereby producing an electrical current in nanoampere range that is related to the number of target DNA molecules present in the sample . The assay was carried out in an Eppendorf tube. Prior to the BBSH, all Eppendorf tubes were covered with BSA by washing with PBS buffer containing 3% (w/v) BSA to avoid unspecific binding of conjugates to the tube walls. In a typical assay, an equivalent of 2 × 107 activated beads (1 × 105 per microliter) was washed and suspended in PBS buffer, pH 7.4, and then transferred to the BSA treated reaction tube. Different DNA samples were subjected to sandwich hybridization: PCR product, purified genomic DNA, DNA in crude cell or in spore lysate. A mixture of the target DNA sample and biotin labeled detection probe was prepared in PBS buffer, pH 7.4. The double stranded target DNA was subsequently denaturated by heat treatment of the mixture for 3–10 min at 95°C. Immediately after denaturation, the target sample and detection probe mixtures were exposed to the capturing beads followed by simultaneous hybridization of the target DNA molecules with the immobilized capture probes and the detection probes. Upon completion of the hybridization (10 min–6 h, 40°C), the magnetic beads were separated from the solution by means of an external magnet. Unbound nucleic acids were removed by stringent washing with PBS buffer, pH 7.4 at 40°C, and an additional washing step with PBS containing 3% (w/v) BSA. Next, captured hybrids were labeled with ExtrAvidin-Alkaline Phosphatase conjugate (Ext-ALP) by incubation of the beads at room temperature with the appropriate dilution of the reporter enzyme complex in TBS buffer, pH 8.0. Subsequently, they were subjected to a washing cycle consisting of three incubations (2 min each, at room temperature, 1000 rpm) in TBS buffer, pH 8.0. To detect the bound Ext-ALP activity, 2 mM solution of p-aminophenyl phosphate (pAPP) (300 μl) was added to the bead suspension and incubated for 30 min at 40°C or 2 h at 30°C. After the enzymatic reaction, the solution containing the product p-aminophenol (pAP) was pumped over the surface of the electric chip and the signal from the redox re-cycling was registered with a potentiostat. Both the chips and the potentiostat were obtained from eBioChip Systems GmbH (Itzehoe, Germany). Prior to every electrochemical measurement TBS buffer, pH 8.0 was pumped through the device to flush out air bubbles and rinse the system. The measurements were carried out at room temperature. The instrument and the characteristics of the electrochemical detection were described in details previously . We thank Adam Iwanicki for providing B. subtilis W168 strain. This work was supported by the European Commission (project-no. QLRT-1999-00533). MGC applied the biochip method for analysis of Bacillus crude vegetative cells and spores, and did the project planning in co-operation with the project leader. HA participated in the procedure development and contributed all experiments. JA contributed with ideas and discussions in the development of the methods. RH participated in the design and coordination of the study. SOE was project leader.